i’ve been trying to steer yang away from baking sweets slightly. 1) i know that i don’t need it, as my snacking habits go into uh oh mode when i’m at home, and 2) pretty sure she has enough sugar in her diet, with all the pearl milk teas and the peach green tea whatevers that she thinks are healthier (they just don’t have sketchily sourced milk powder and supposedly cancer-inducing boba, which i’m sure helps but still certain there’s too much sucre). caramelized veggie and cheddar frittata for lunch? i think yes. even though both of us were kind of wary of using so many eggs. one of the recipes we saw (maybe ina’s?) had 12 eggs for the recipe. that’s a whole carton, dang. even if you’re not eating all that in one sitting, it’s a lot. the beauty of frittata (any frittata, not just this caramelized veggie and cheddar frittata) is that you can do what you want with your body frittata (apologies for that cover just don’t stare at it). i doubled the amount of onion because i like it. i did a whole red bell pepper instead of half red half green to make my life easier and because i think green peppers taste like the sad, bitter tears that pop out when you realize that if only you hadn’t screwed up your third midterm (um it stops being a midterm in the middle of the term when you have three), you could have gotten an a in your math class because you actually didn’t do so bad on the final. anyways. yang dealt with her pepper aversion by spearing them with her fork and feeding them to me. frozen corn instead of fresh because i haven’t seen any fresh corn yet (i also haven’t gone to the grocery store yet). frozen spinach instead of raw broccoli because no prep + some spinach was smirking at me from the freezer. i had about 1/2 cup each corn and spinach instead of a full cup of each; whatever floats your boat. all of it got sauteed instead of getting roasted. nbd. frittata is forgiving. for the queso that sounded so ungh good, i used half and half instead of heavy cream, and tillamook sharp cheddar (not sponsored ofc, though that would be cool) that was yellow instead of white. so no color contrast between the queso and eggs. whatever, taste > appearance PERIOD. yang immediately volunteered to grate said cheddar, but then wimped out fairly quickly. we had about 1 cup cheddar, which is roughly 8 oz, so i crumbled in some feta for good measure. it never got super thick; i figured it would work itself out later. it’s a smart cookie. for the eggs: milk instead of cream, and a couple of large pinches of herbes de provence. we cooked this caramelized veggie and cheddar frittata stovetop on medium to medium-low heat for 25-30 minutes because it was hot, so hot, too hot to turn on the oven. we probably could have pulled it sooner, but i’m going to blame the queso. it stayed wet for a looong time and made it hard to tell if the eggs were done or not. apparently gung gung, my grandpa, used to have a catchphrase when something tickled his fancy: “very tasty.” innocuous enough, but the way my mom imitates it, the first syllable of “very” gets stretched out and dare i say it, there’s a touch of a chinese accent. and though gung gung might not have given this his seal of approval, i do. the veggies were sweet and tender, the quantity plenty for a girl who loves her veggies and also for another who considers a spec of green atop her steak as a salad (oh, yang). don’t worry about totally cooking the veg down in the first roasting/sauteing/caramelizing step, since it ends up cooking more while the egg lighten and set. in fact, the bottom ended up slightly burnt. not a one could tell, but in order to prevent this, you can 1) bake it (more even heat), turn down the stovetop heat (be prepared to wait awhile for your egg beauty), or make smaller frittatas so that you can cook them slowly but still be able to eat them within a reasonable amount of time. there were nice pockets of cheese, but i did feel like the queso was unnecessary. just use cheese- healthier, easier, less dishes, takes away the is-this-queso-or-uncooked-egg-that’s-wiggling-here question. you could eat this with a light salad, tossed with a bracing vinaigrette (my preferred dressing would be high vinegar, garlic, mustard and low maple syrup, extra virgin olive oil), or do as we did and toast up some crusty bread that was promptly dunked into a puddle of extra virgin olive oil. your choice. For the vegetables: In a 10-inch skillet, heat some oil over medium-high heat. Saute the onion, bell pepper and mushrooms until browned. Add the corn and spinach, cooking until the water has evaporated. Season with salt and pepper. For the frittata: mix everything. Pour the eggs on top of the veggies. Cook over medium to medium-low heat until the eggs are set, about 25-30 minutes. You could also bake it at 475F for 25-30 minutes. Cool slightly before serving. This looks yummy!! I will have to give it a try! 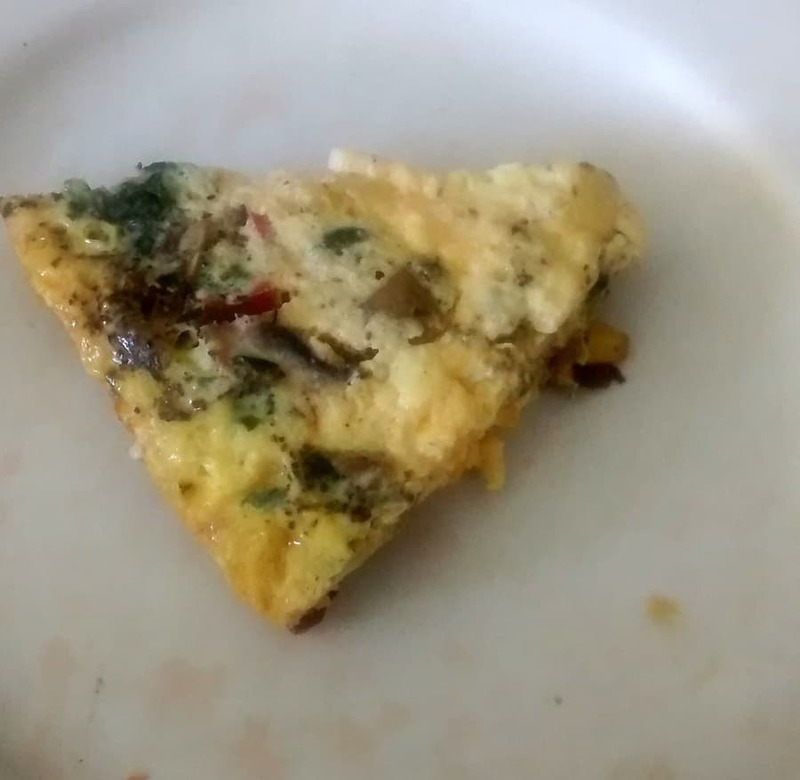 I love frittata's!! thanks! i love frittatas too; they’re so versatile. yes!! who cares if something is pretty if it tastes horrible? agreed! i love how versatile frittatas are, and this one is so delicious with all the veggies.